"The United States Federal Reserve bankers are already prepared for a hostile merger of Canada with the United States with the aid of Stephen Harper. The same bankers who orchestrated the United States Wall Street swindle ($12.5 trillion bailout the Federal Reserve bankers swindled from the American taxpayers - as of December 1, 2010) are banking on Stephen Harper winning a majority on May 2, 2011. They are laying in wait until Harper wins a majority and dissolves Canada, the Canadian flag and the Canadian Dollar. 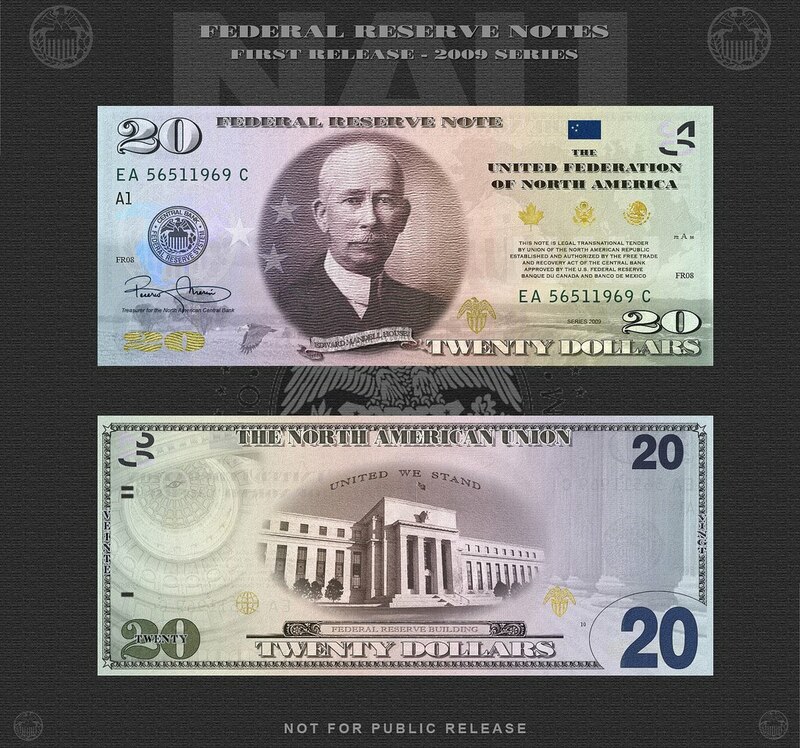 The Federal Reserve’s North American Union Note (sample image above) has already been printed to replace the US Federal Reserve Note, the Canadian Dollar and the Mexican Pesco. Why is the Federal Reserve printing North American Union Notes? The United States is financially bankrupt – thanks entirely to the Federal Reserve Bankers. The Federal Reserve Bankers orchestrated the largest swindle in the history of the United States, and the World, by fraudulently declaring loses of $billions. These bankers fraudulently declared that their banks would fail unless the US government paid them $trillions in bailout money. Both George W Bush and Barack Obama were willing conspirators in the massive swindle of over $12.5 trillion from the American taxpayers. Because Bush and Obama handed over $trillions to the federal Reserve bankers the United States has no money to finance its social programs, its health care system, the American peoples’ pensions, its military, its government and all of its financial obligations. The Japan earthquake and tsunami added to the US economic woes as the second largest holder of US debt can no longer support the US economy. Japan is itself faced with the massive financial burden of rebuilding and can no longer afford to buy the US debt. China can clearly see that the U.S. financial system is effectively insolvent and is now starting to dump the worthless US federal Reserve Note. The Note Reads – “Federal Reserve Note.” It has a Federal Reserve bankers adopted NAU flag (blue with 3 white stars that represent Mexico, the US and Canada) above the words “The United Federation of North America”. Below it the Federal Reserve bankers boldly claims “THIS NOTE IS LEGAL TRANSNATIONAL TENDER BY UNION OF THE NORTH AMERICAN REPUBLIC ESTABLISHED AND AUTHORIZED BY THE FREE TRADE AND RECOVERY ACT OF THE CENTRAL BANK APPROVED BY THE U.S. FEDERAL RESERVE BANQUE DU CANADA AND BANCO DE MEXICO." Ahh, this looks fake. 1) I don't think they'd ever put a picture of the Federal Reserve building on the back. They want imagery that invokes pride and sentimentality about the history of our land. No one's proud or sentimental about the Fed. 2) What's with the portrait on the front? Usually these are supposed to be hand drawn, but it looks like someone put it through a crappy filter in Photoshop. 3) The eye on the roof of the building is creepy by anyone's standards. 4) Not complicated enough. 5) Some of the pixels, and from seeing quite a few shops in my time.